Few regiments of the British Army have such a varied and exciting tale to tell from the time it served in Ireland as long as 1689, then throughout Marlborough's campaigns, the American War of Independence, until the present day. It is now recognised for its modern professionalism and for its distinct Welsh flair. Sir Stanley Baker's film 'Zulu' recreated the events surrounding the heroic defence of Rorke's Drift by B Company, 2/24th in the Zulu war of 1879. 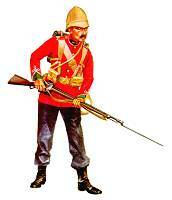 The Regiment has taken part in every major campaign and war, winning high praise wherever they have gone. In their long record of cheerful courage whatever the odds, the Royal Regiment of Wales, and its predecessors have won 29 Victoria Crosses, Britain's highest award for gallantry, and over one hundred Battle Honours. The Regimental Museum, which is located at Brecon in mid-Wales, the Regiment's home for over 120 years, tells this compelling story. The Zulu War Room contains a fascinating display of artefacts. There are over 3,000 medals in our Medal Room and our gun collection traces the evolution of solders' weapons from 18th Century to present day. Pictures and paintings, dioramas and drums, assegais and ammunition, buttons, badges and uniforms combine to form a vivid image of soldier's life - we have things to interest everybody. Do come and see us. Train to Abergavenny, Newport or Merthyr Tydfil. Regular bus services from these stations. Brecon is 42 miles north of Cardiff and close to the Brecon Beacons National Park. The Museum is adjacent to the Barracks in Brecon in The Watton (B4601).